Yee Haw! I'm kicking up my heels with excitement. I have a new 'recipe' on Moda Bake Shop today as part of their ABC Birthday Quilt Along. 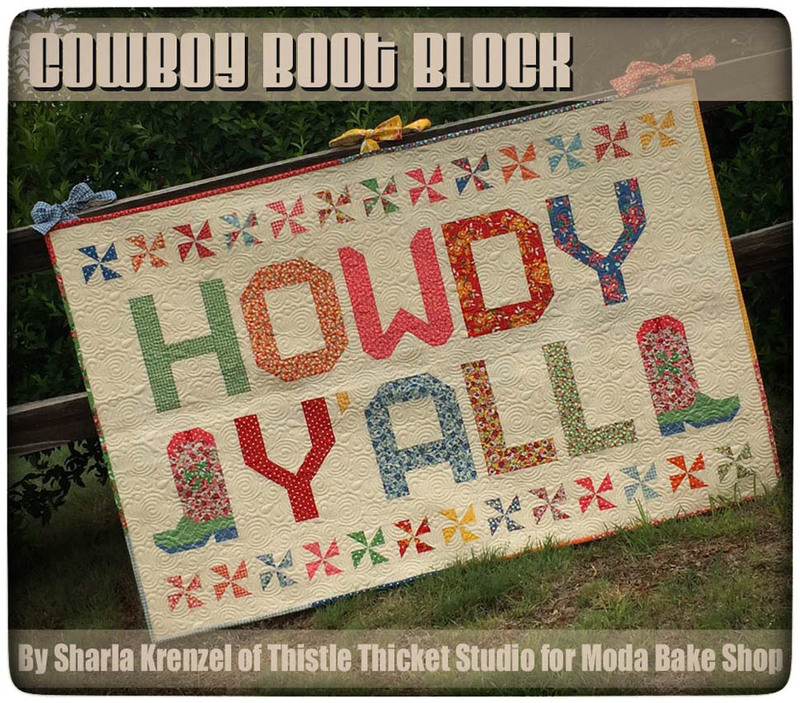 So scoot a boot over there to check out my "Howdy Y'all" quilt and tutorial on how to make my Cowboy Boot filler block! When MBS put out an invitation to submit project ideas for their birthday co-hosting application, I immediately thought of this Howdy Y'all banner quilt. 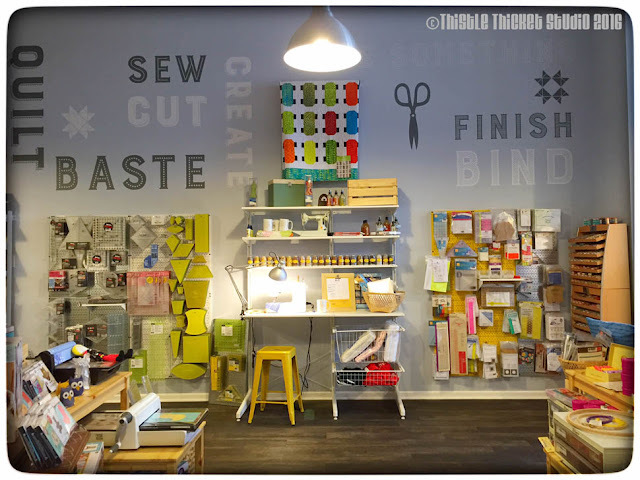 When I think of Moda, I think of visiting their warehouse in Dallas on our way to quilt market in Houston back in my quilt shop days. And I think of Lissa Alexander (ModaLissa) and our Moda rep, Laura; both of whom exude southern hospitality and charm. 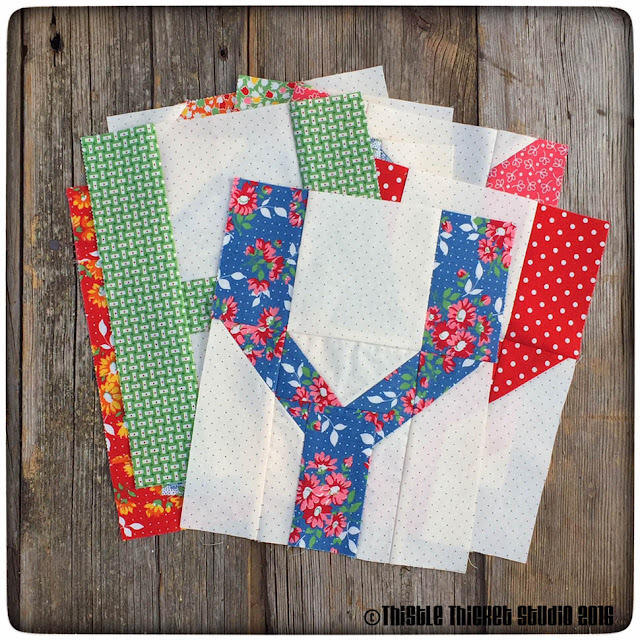 I also had been toying with the idea of making a quilted banner to hang on the fence on our farm to welcome friends and family. 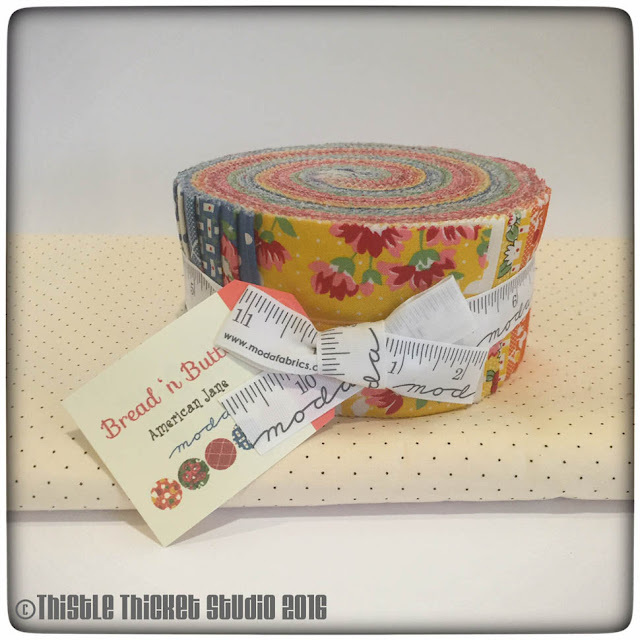 I chose American Jane's new fabric line called "Bread 'n Butter" because I thought it had a wonderful country girl feel to it. The background fabric is an American Jane basic pindot. I just love a pindot background! 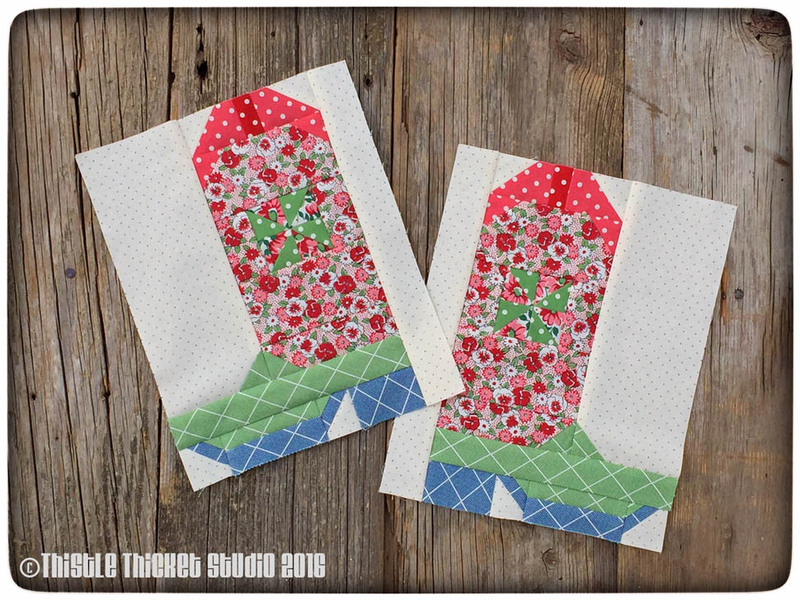 My recipe on MBS is a step-by-step tutorial on how to make the cowboy boot filler block, but I also included a short explanation and cutting instructions to make the quilt too. Of course, the quilt features Moda's "Spell It With Fabric" letter patterns which is the basis of the ABC Birthday QAL. I used a new long-arm quilting pattern on this quilt called Marmalade by Leisha Farnsworth at Urban Elementz on this quilt and I just love it! The back really shows off the quilting! I inserted three rows of strips through the center of the back because my quilt was just a little too wide for one width of 45" width fabric, but I love a pieced back and I think this turned out awesome (if I may say so myself). 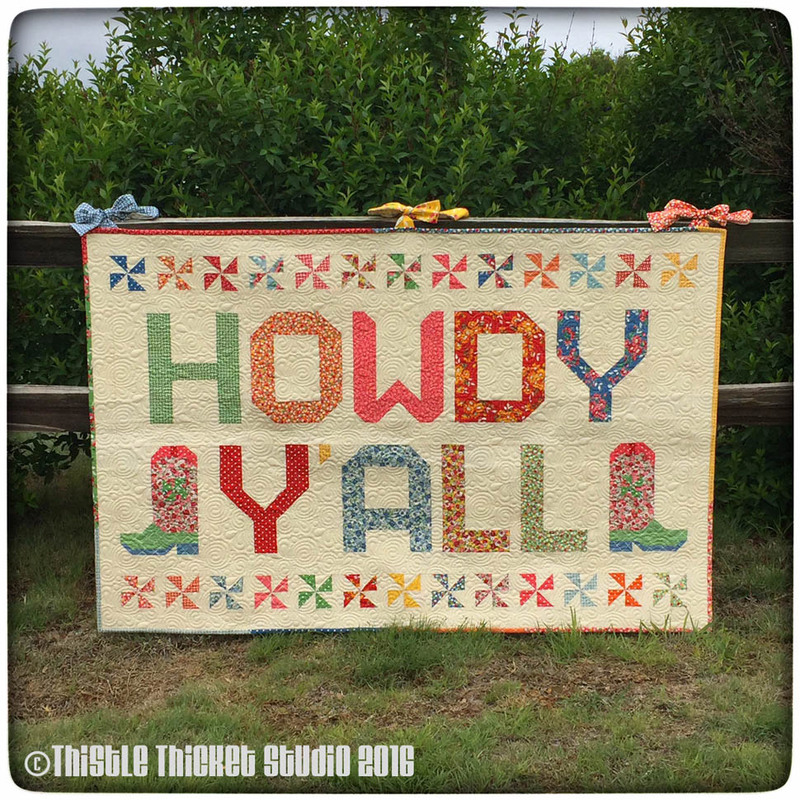 Now I can't wait to have my quilty friends over so I can hang my 'Howdy Y'all' quilt. 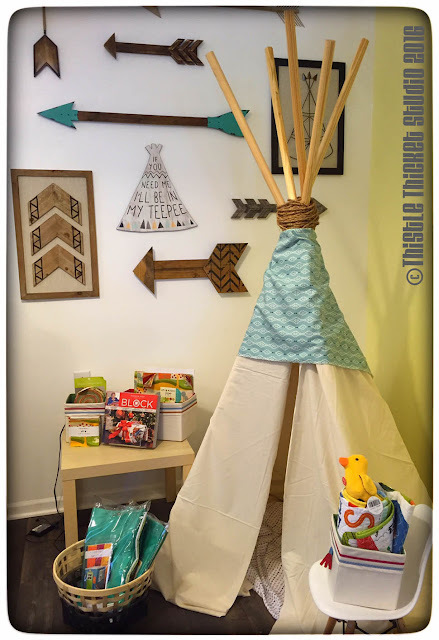 Most people tell their friends "Come on over and I'll put on a pot of coffee", but I'll be like "Let me know before you stop by and I'll hang my quilt!" Ha, Ha! Grow: to become better or improved in some way. My mantra for this summer. 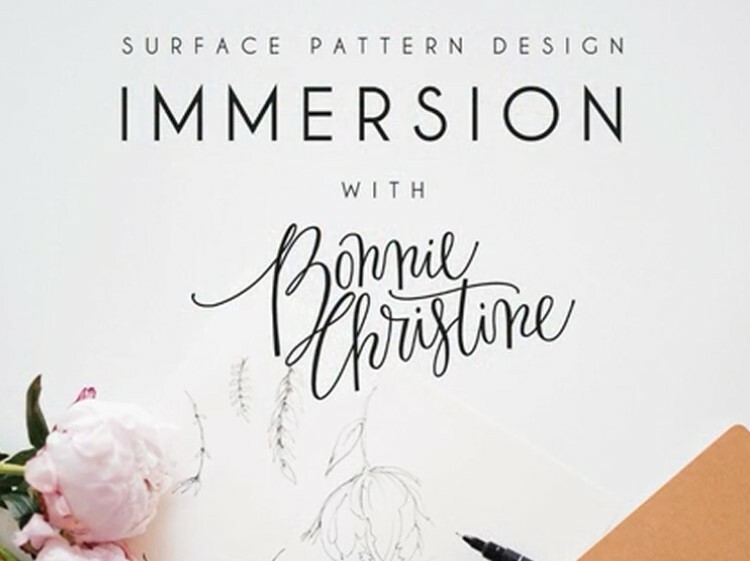 I also want to grow my knowledge about fabric designing and pattern writing. 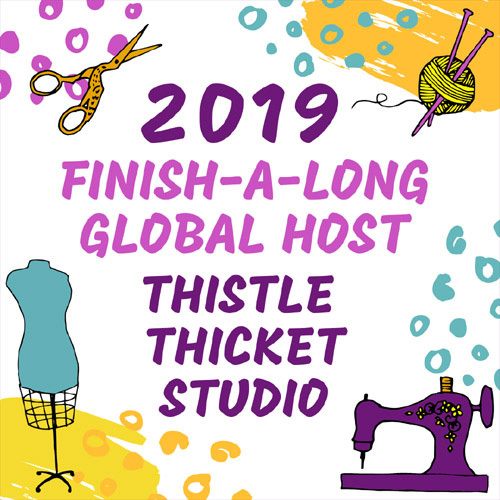 It's been a goal for quite some time now but I seem to get sidetracked by all the quilt alongs, blog tours, swaps, and social media in general. I have two blog tour commitments in June and July, but I'm going to resist committing to any more so that I can dedicate some time to this goal. I'm writing this down here so you all will keep me focused and on target! And after working in my yard all afternoon watering, weeding and mowing, I am hoping all my work will help it grow into a beautiful oasis. Ha! I'm really just hoping that it stays alive and survives the summer. I discovered today one large pot that I planted a couple of weeks ago has already become a victim of the rabbits that think my flower pots are their salad bar! P.S. 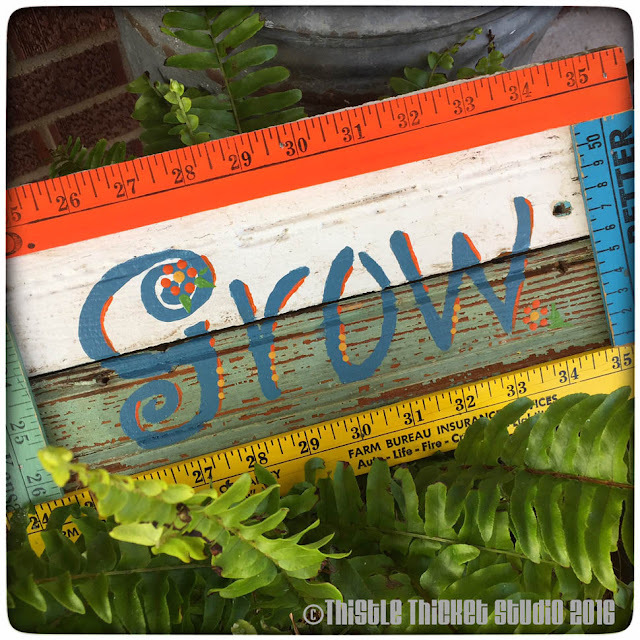 I did take a creative break this afternoon between mowing and pulling weeds to make the "Grow" garden sign above. A reminder for me to continue to grow - personally and creatively. 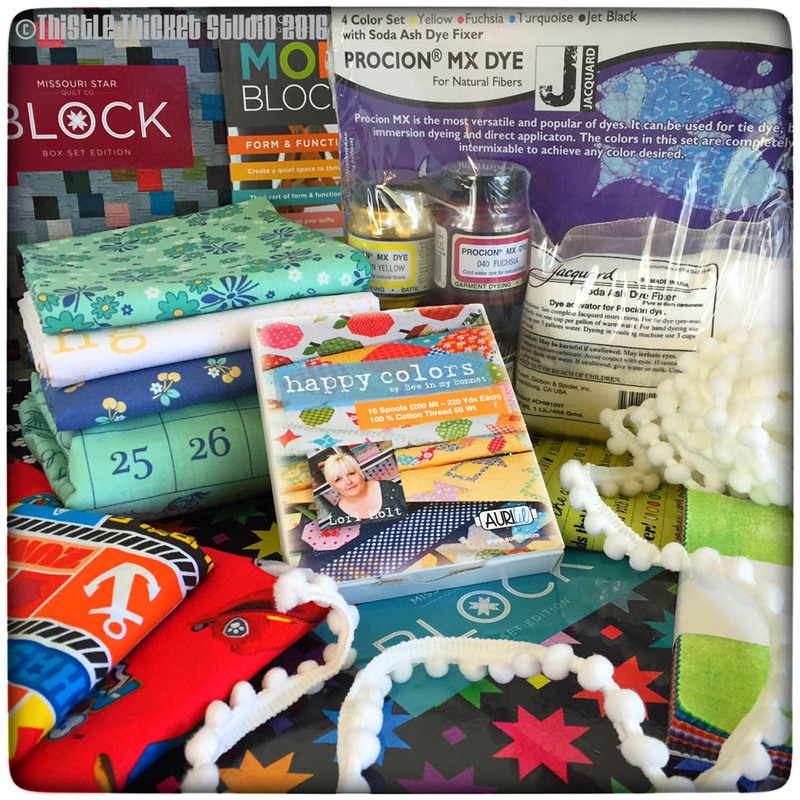 Congrats Quilting Tangent! 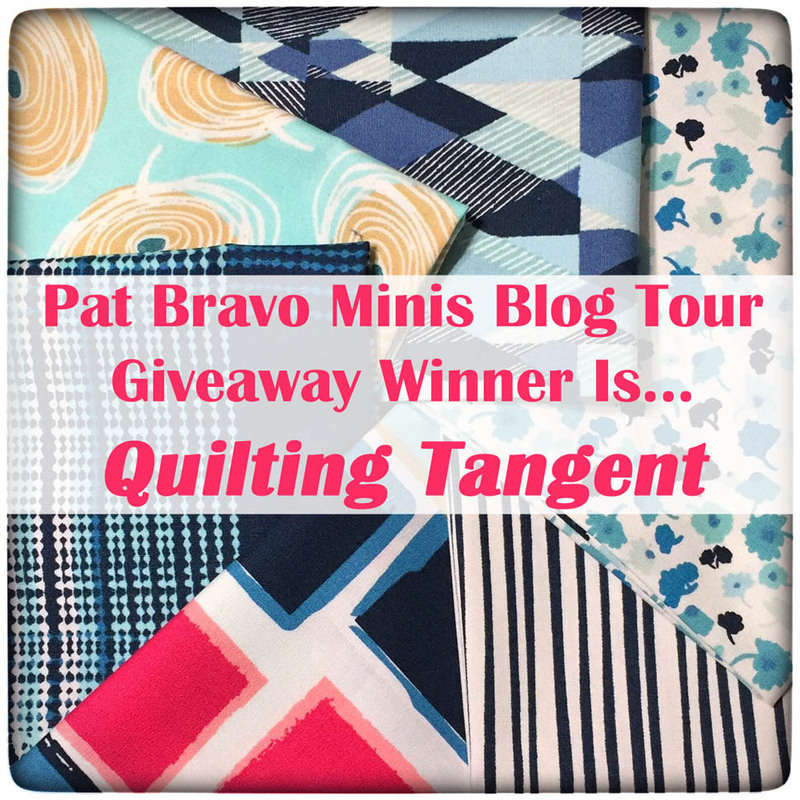 You are the winner of my Fat 8th Bundle of Pat Bravo Fabrics (plus the scraps left over from my mini)!!! 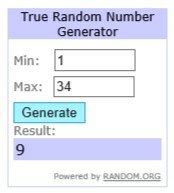 The winner was selected using Random.org. 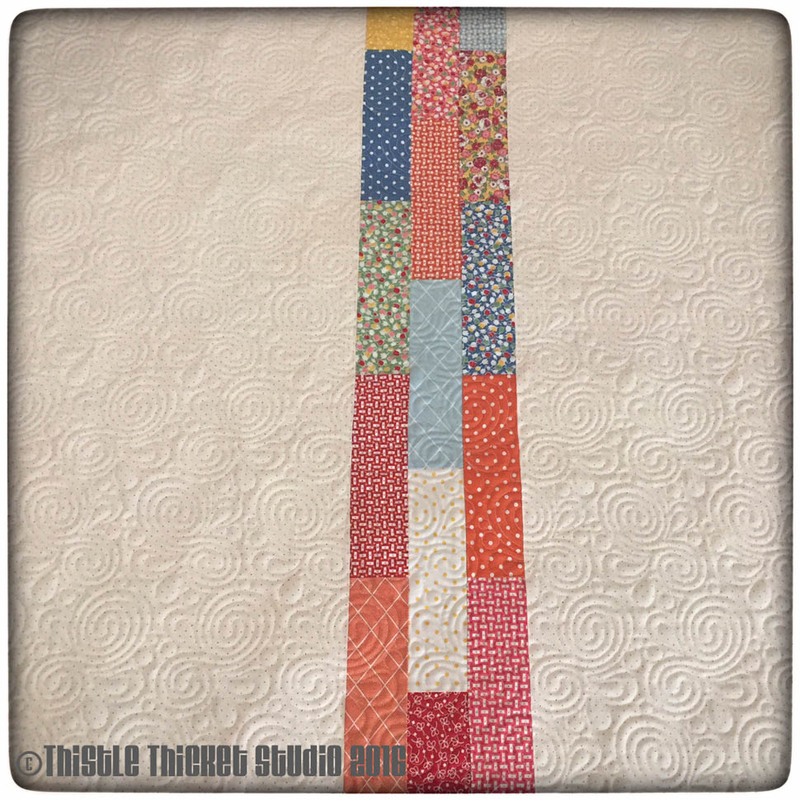 Quilting Tangent, please email me your mailing address within the next three days. If I don't hear from you by then, a new winner will be drawn on Monday. Thank you to everyone who visited my blog during the Minis Blog Tour and to everyone who left a comment. I really appreciate your support! UPDATE: Quilting Tangent never responded so I drew a new winner. Congratulations to Kathy H. We've already been in contact with each other & the Pat Bravo fabric bundle will be on its way to her soon. Wow, where has the week gone! Seems I've been quite busy but don't have much to show for it, but I thought I'd share anyway. I've been spending most of my time working on my 'recipe' post for Moda Bake Shop that will be featured on May 26. 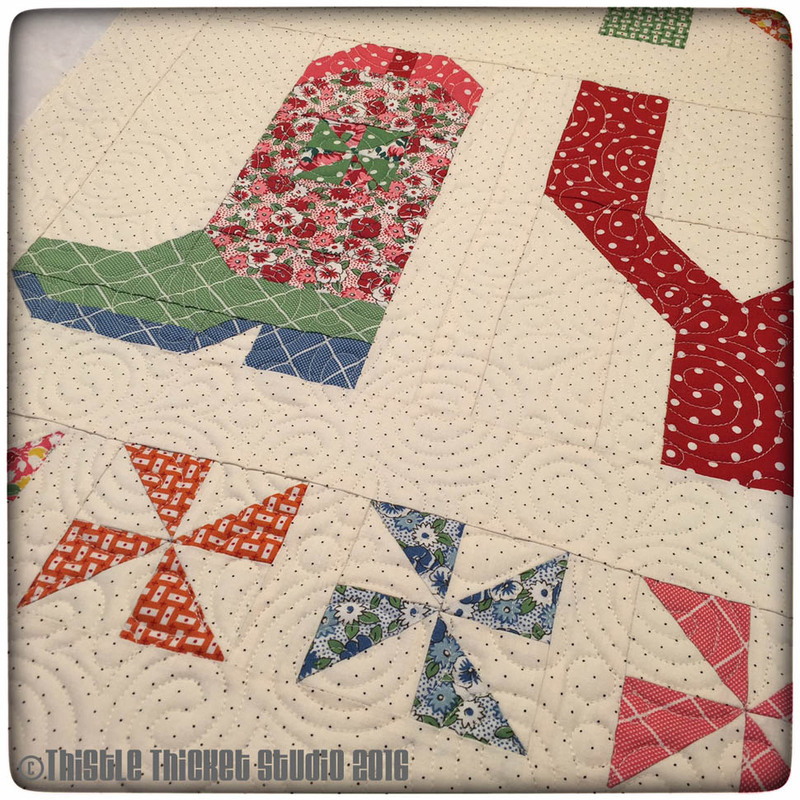 I'm really excited to share my "Howdy Y'all" quilt and tutorial on my Cowboy Boot block. 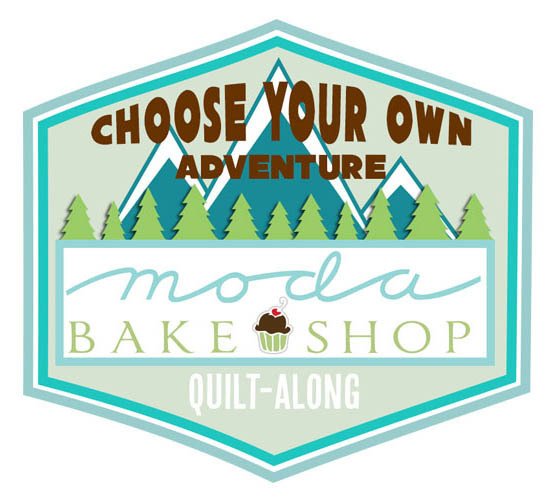 I am honored to have been selected as one of the co-hosts of Moda Bake Shop's Birthday QAL celebrating their 7th year. Each co-host has or will be featured on MBS with a filler block tutorial and their quilt using Moda's "Spell It With Fabric" letter patterns. 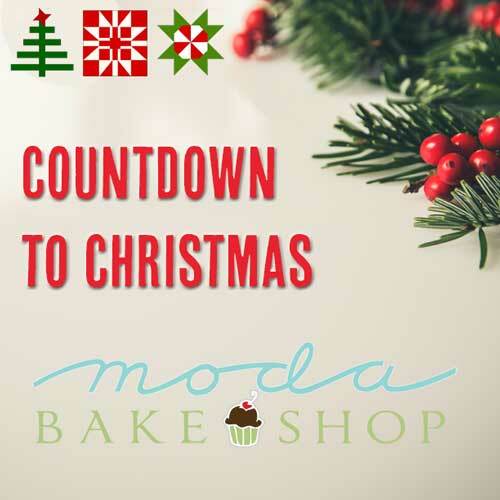 You can get some great ideas on how to use the letter blocks on Moda Bake Shop under the Events tab. I also shared an idea earlier this year for Monogram Pillows using the letter blocks. These blocks are really quick & easy to make so it's not too late to join in the fun! 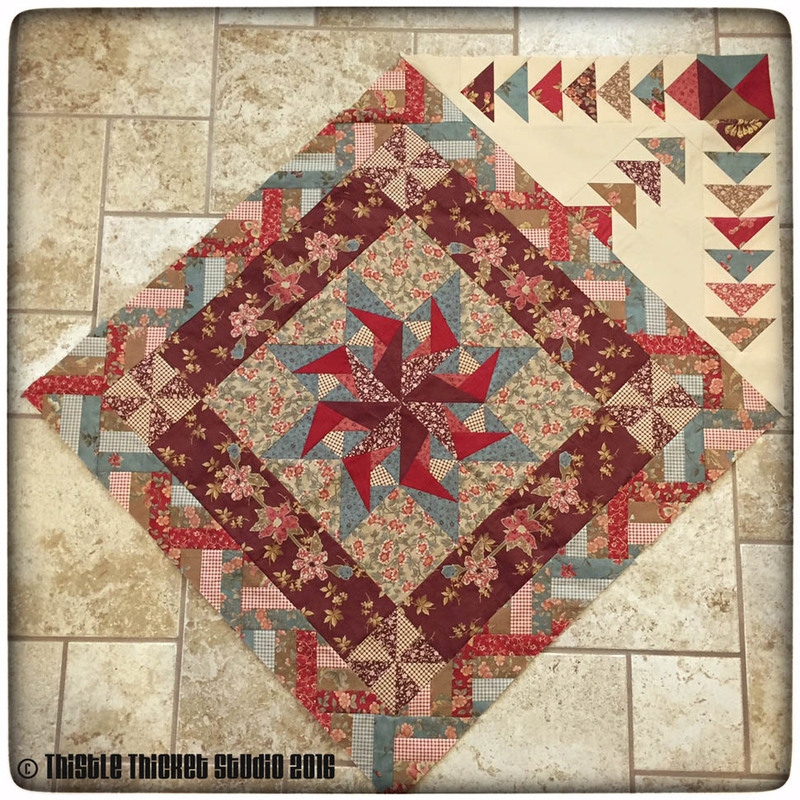 I took a break from working on my "Howdy Ya'll" quilt to work on my quilt guild's medallion quilt challenge this week before our meeting. I only got one corner completed as it took me awhile to figure out the math to determine my setting triangle measurements. But now that I have it figured out, I'm hoping the other three corners will go faster - unless I forget what I did by the time I get back around to working on it again! 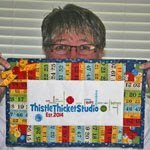 I guess it's a hazard of being a quilter with too many works in progress! I also spent some time working on a quilt block of a different sort. 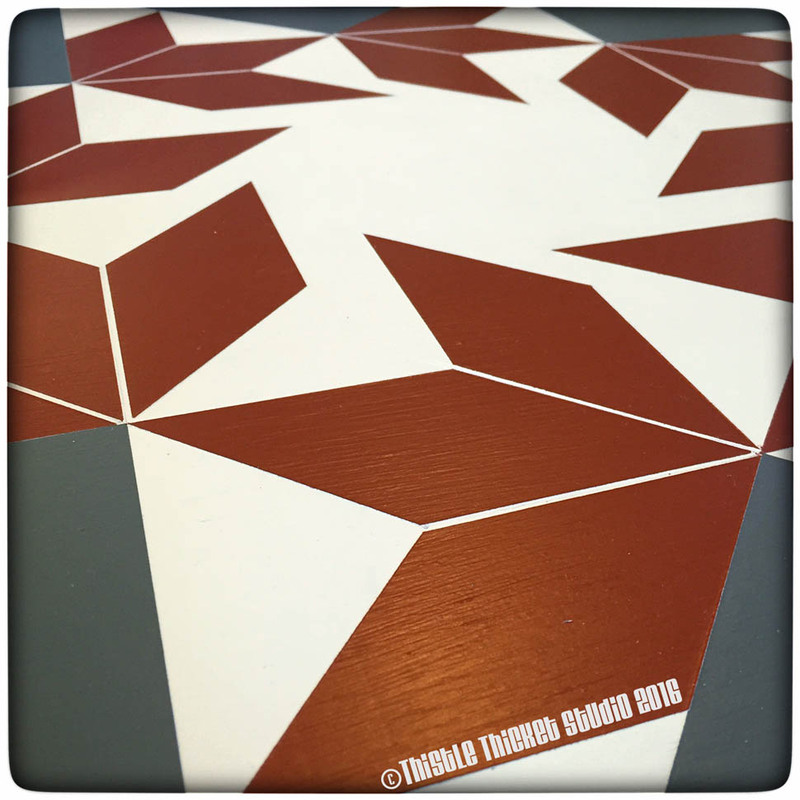 Next week, my quilting friends are getting together to paint barn quilts and we have to have our boards primed and ready to paint the designs on prior to getting together. Well, once I got started, I couldn't stop and have finished my first one (except for the frame). So now I've decided to make two more, all in the same red, gray & white color scheme, to hang on the front of one of our barns. Stay tuned for a future tutorial on how to make your own! A few days ago, I went with the hubby down to one of our fields where his great aunt's original homestead is located. There isn't much there anymore but I managed to find a few rusty metal pieces - a tin can, an oil can lid & some old hinges - that I brought home with visions of a flower plant stake. It's primitive, I'll admit, and my husband can't see the beauty in it, but I love it! Doesn't it look cute out in the wheat field? Last weekend my mom & I went to an antique auction & look what followed me home! 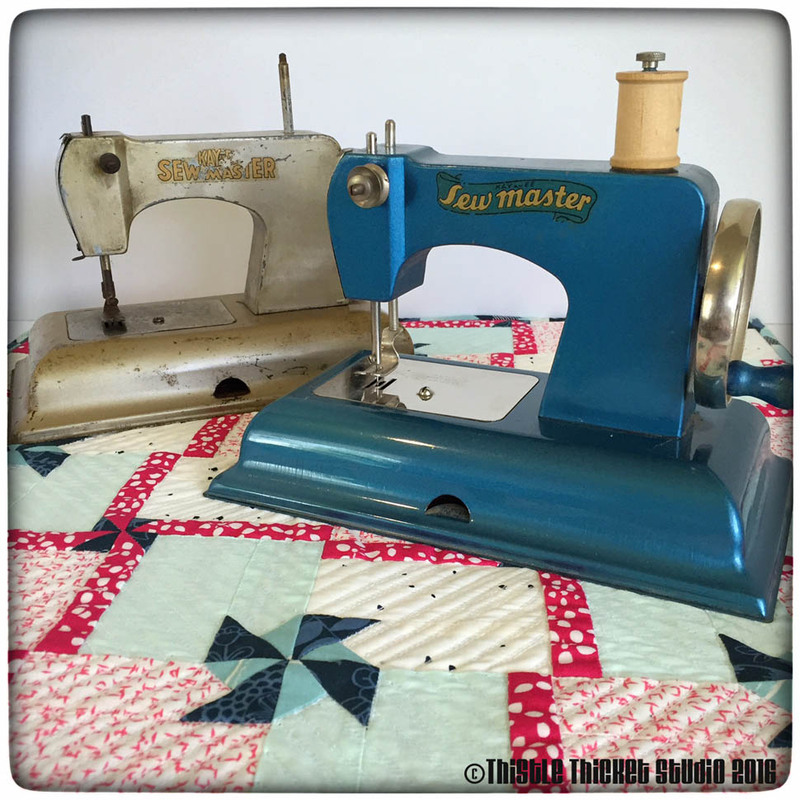 Not one, but two, vintage little toy sewing machines! Aren't they cute too? The rest of my week has been spent on the mower or pulling weeds. 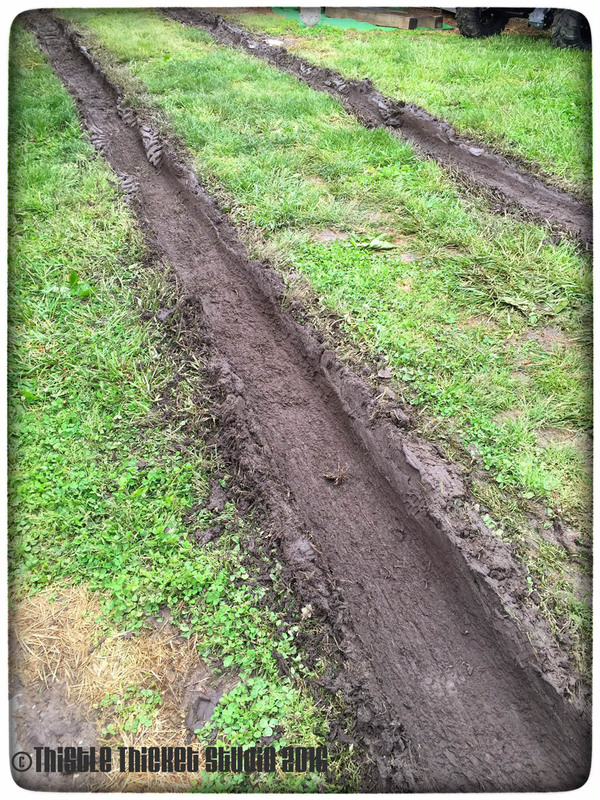 Not my favorite things to do (although our zero-turn riding lawn mower is pretty fun to drive!). 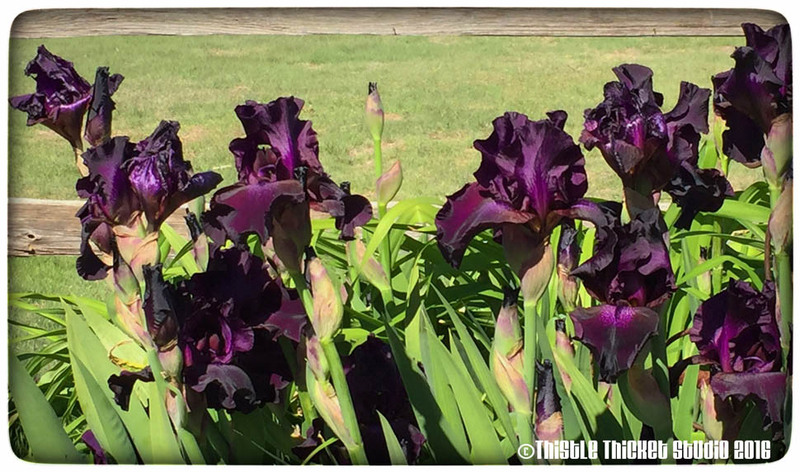 But, I am enjoying these irises, the first flowers of spring in my yard. Oh, and I planted flowers in all of my patio pots - 16 in all. My patios look so pretty now! I better get back to that "Howdy Y'all" quilt. May 26th will be here before I know it! Have a great quilty week y'all! Road Trippin': Sparks Antique Flea Market & Missouri Star Quilt Co.
My mom is my best friend & I love to go places with her. 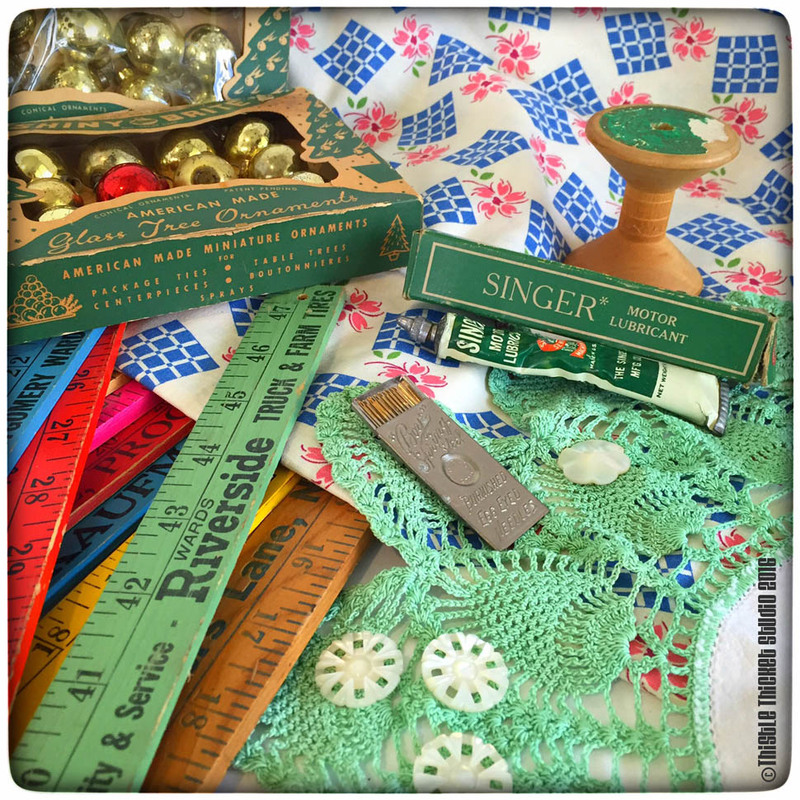 We have the same interests (junking & quilting, among others) and the same shopping style. So when I want to go on a road trip that the hubby isn't interested in, my mom is my go-to gal. There are places to see & things to do that are on my bucket list & this weekend my mom & I marked a couple of them off my list. 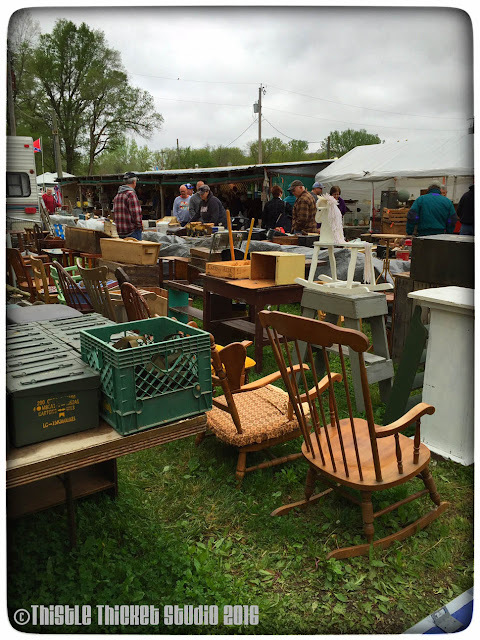 One of those bucket list items was the Sparks Antique Flea Market in Sparks, Kansas, population 9. 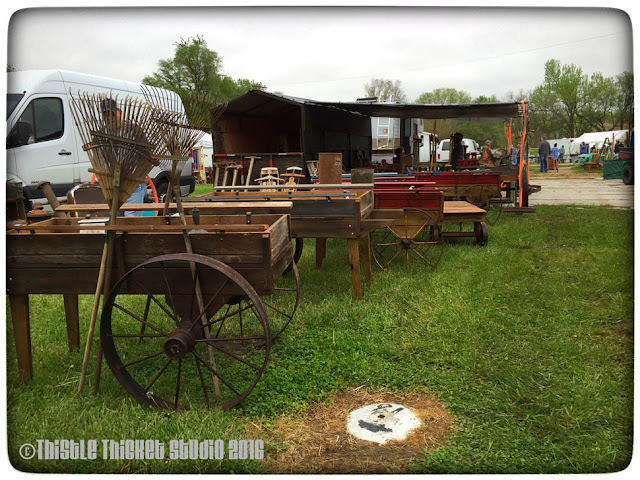 Midwest Living Magazine called it a 'can't miss' flea market that attracts 75,000 people during the 4-day event each spring and fall. 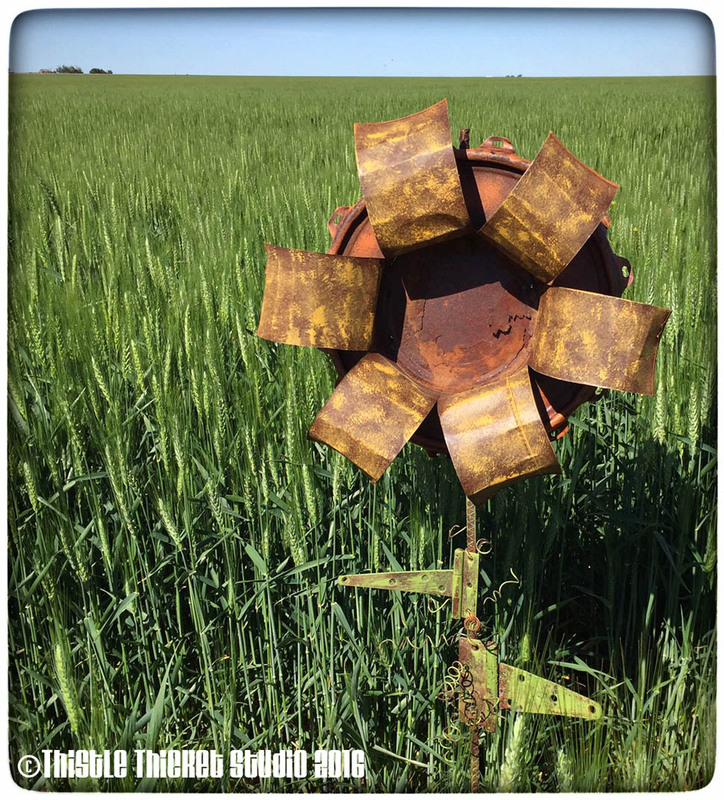 I can't believe I've lived in Kansas for more years than I want to say (a girl has to keep some secrets!) and I haven't been to Sparks! So mom & I hit the road last week to remedy the situation. Sparks sits at a Y in the road and is home to a couple of occupied homes and a few vacant houses. We would have missed it except for the cars that lined the ditches along the highway. Most of Kansas has been blessed with rain the past week and northeast Kansas was no exception, which made for a muddy mess at Sparks. It was cold & damp (Hey weather, don't you know it's May?!). But that didn't scare the shoppers, although I think it did keep a few vendors away. 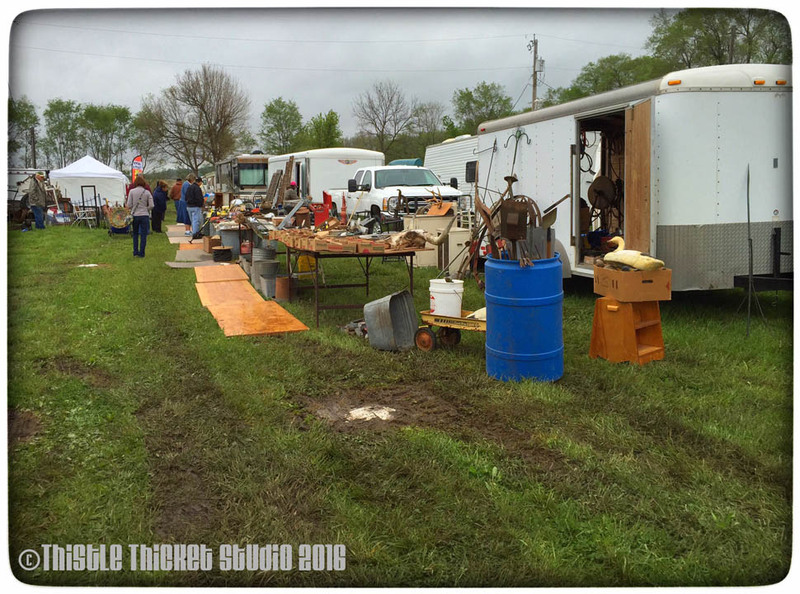 Mom and I spent the day wading through the mud to scour the 450 vendor booths looking for hidden treasures. I hit the yardstick jackpot in Sparks (you know how I love yardsticks!) and came home with my fair share. And I came home with an upcycling idea or two also. I loved these wagon carts using old iron wheels. At the end of the day, we had walked a little over 6 miles and found a few treasures. A few of my favorites were some vintage sewing notions and buttons, little vintage Shiny Brite balls, some feedsack fabric, a doily in my favorite green color, and of course, yardsticks! On day 2, we hit up White Cloud, just down the road from Sparks, which also has a flea market on the same weekend. 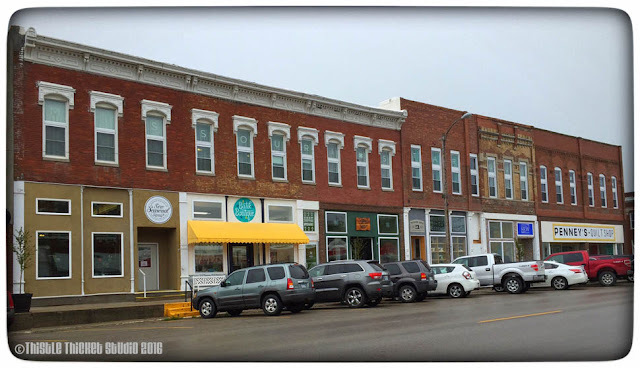 It was much smaller and by mid-morning we had seen it all and hit the road to visit a few quilt shops in the area. 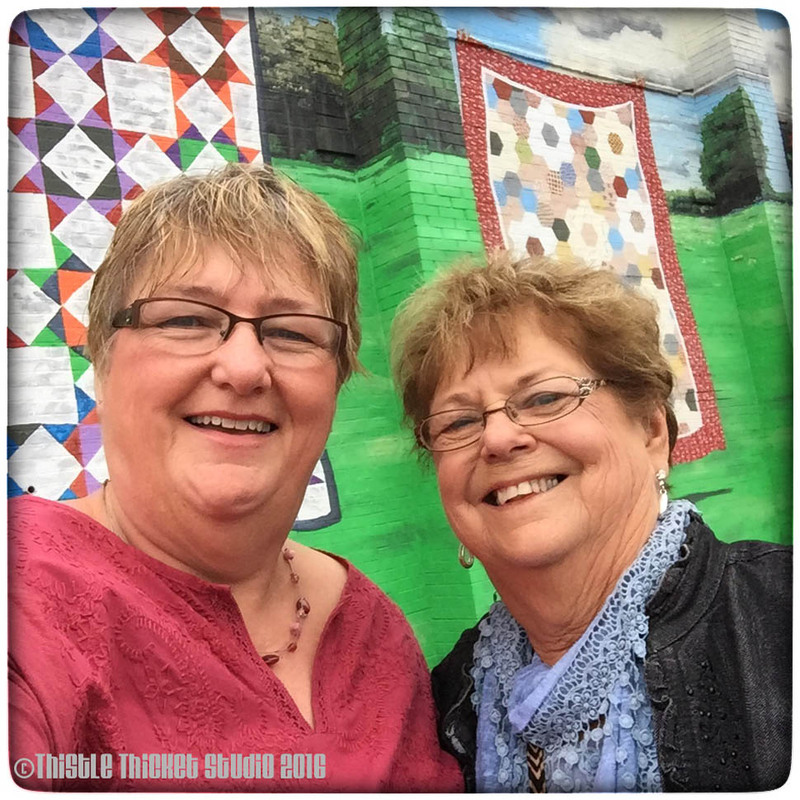 We were just getting primed for my next bucket list item - Missouri Star Quilt Co.! 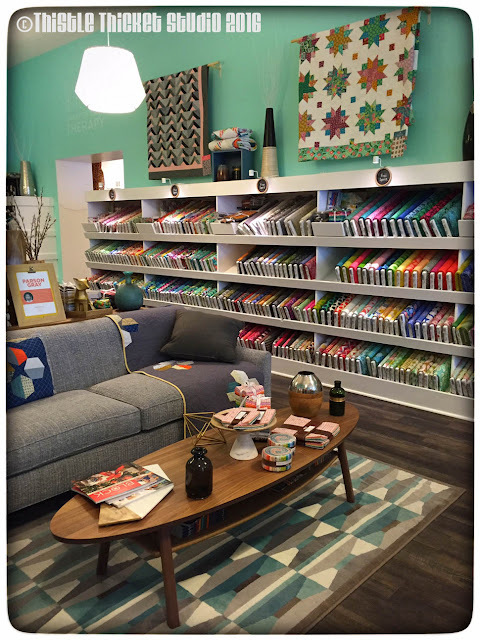 With my economic development background, Missouri Star Quilt Co.'s story just amazes me (check out these articles in Inc. Magazine and Business Insider) and I've been wanting to see this quilting wonder for quite some time. Located in Hamilton, Missouri, MSQC fills 10 or 11 (I lost count) of the downtown buildings on main street. 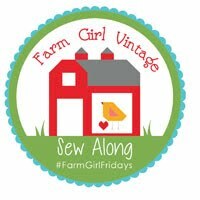 Each building houses a different themed shop - batiks, florals, reproductions, modern, licensed fabrics, juvenile, holiday, etc. Each shop was so inviting and spacious, and decorated so cute. 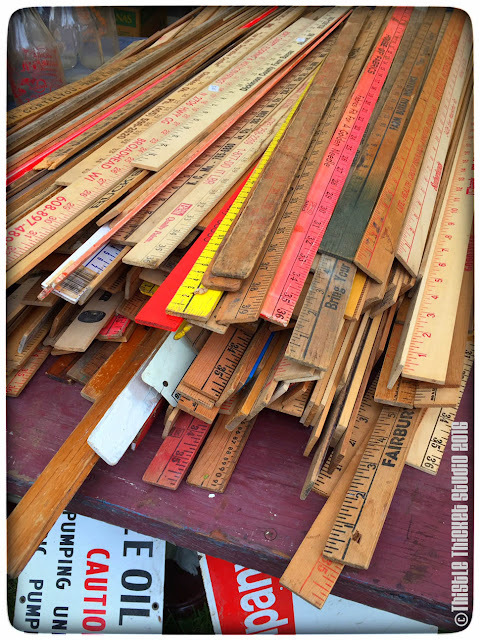 The 'Machine Shed' housed notions - threads, rulers and more. The 'Modern Shop' had a hip, retro vibe. MSQC thought of everything! 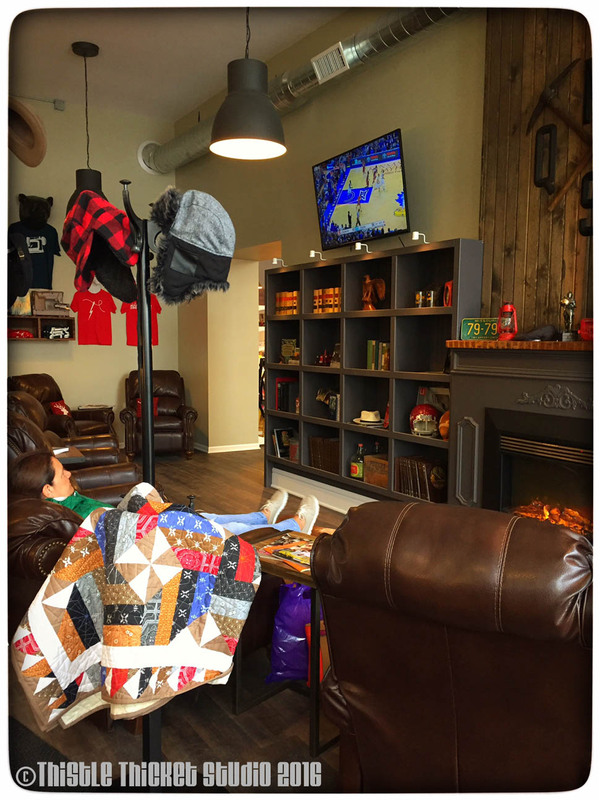 They even have a man cave for the hubbies to hang out in while the wives shop - or for tired quilters who need to prop their feet up! I managed to bring home my share of quilting supplies from our quilt shop stops, including some Lori Holt Calico Days fabric & her Aurifil thread collection for my Bloom quilt that I haven't started; some Paw Patrol fabric to make zipper bags for my grandson; some Bobbins & Bits selvedge print fabric by Pat Sloan; MSQC Mod Block magazine; some cute trim; a charm pack or two; and what I'm most excited about - some fabric dye to try my hand at ice dyeing (I feel a new blog post coming in the near future). I always have a good time with my mom and this road trip was no exception. Thanks mom for being my best friend! Hmmm, wonder what I can come up with for our next road trip? Any suggestions to add to my bucket list?